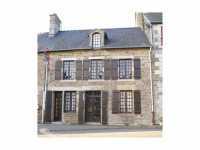 AHIN-SP-001041 • Mortain Area • 3 bedroomed semi-detached stone house with 1,229m2 garden 4km from a village with all local amenities. The property was renovated around 2004 and benefits from double glazed wood framed windows, character features including exposed stone walls and beams and vaulted ceilings on the first floor, a double car port and a quiet position. Located in a small lane not far from a village with bar and boulangerie, this spacious home has views across the open countryside. The house is built of rendered block with a slate roof. The house is situated in a position on the outskirts of a village and within walking distance of the bakery, 2 bars, hairdresser, café and small supermarket. 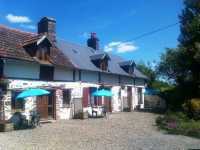 3 minutes from St Hilaire du Harcouet, half-timbered house facing south on 2,700 m² of garden in a quiet area. Near shops. Pretty 5 room master house with garden. Nicely planted garden, open garage. Mains drainage. Central heating. This detached Town House is in an elevated position and offers surprisingly spacious accommodation on 2 floors with some original period features. There is a small enclosed garden to the front and enclosed courtyard to the rear with storage. What a snip for someone with the skills to restore this beauty to its former glory! AHIB-SP-001094 • Spacious 4 Bed Town House over 3 floors, enclosed courtyard garden. The property would lend itself to use and a Bed&Breakfast with 2 en-suite bedrooms. It benefits from character features including exposed beams and stone walls and double glazed Upvc windows with roller shutters. 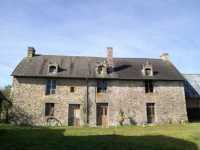 Rural property with outbuildings in Normandy with 1.25 acres. 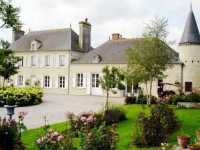 In a quiet position overlooking its garden and outbuildings. Further modernisation is required. An established business opportunity, a family home with three gites and a swimming pool all tucked away in the Normandy countryside near Brecey. 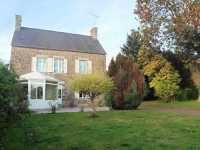 AHIN-SIF-001027 Le Teilleul 50640 Beautifully renovated detached house with over and acre and outbuildings in a quiet rural hamlet. This superb house has been loving renovated in traditional style but with attention to detail including bespoke Oak kitchen and staircase, oak floors on the ground floor, exposed beams and a granite fireplace. 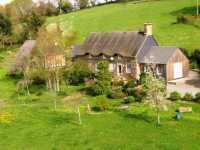 AHIN-SIF-001018 • Ger Area • 3 Bedroomed Spacious detached Normandy Farmhouse with over an acre and outbuildings. 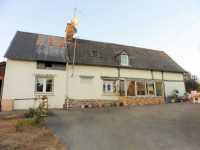 At the end of a no through road surrounded by farm land, in a quiet rural hamlet. It offers potential to extend the living accommodation into the adjoining barn and workshop, if required, or creating a separate gîte.